Why did five Pelican Bay guards beat two elderly Black prisoners on Aug. 6? 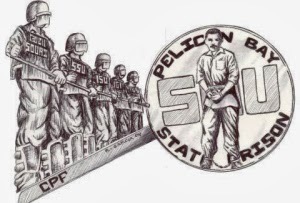 Written Aug. 6, 2013 – The California Department of Corrections and Rehabilitation believes it is necessary to change the course of our peaceful struggle to one of violence, which does not serve prisoners’ interests but actually gives power to the state to impose strict violent measures and actions that will subdue us as a prison class, while at the same time allowing CDCR to be justified in beating and murdering prisoners if they retaliate violently against CDCR officials. Be it noticed that the CDCR conspired on this day, Aug. 6, 2013, to attack two elderly New Afrikan prisoners in the Short Corridor in order to provoke violence out of the New Afrikan prisoners. As a New Afrikan myself and understanding all too well what’s at stake and why CDCR has resorted to such desperate attacks, I would first like to commend the two elderly New Afrikans who allowed their discipline to take precedence over their natural impulses, which is to defend themselves, initially by any means. Instead, they respected our peaceful protest. Their belief in our peaceful protest allowed them to de-escalate something we prisoners know all too well could have easily gotten out of control. No prisoner will willingly accept five strong Pelican Bay State Prison officers beating on elderly prisoners, who they have in prison restraints already. This is why the New Afrikans were chosen to be attacked, so that all prisoners who witnessed the attacks would be angry, because if an attack like this happens now, then it can happen to us all. Plus, no one respects or likes people who abuse the elderly, especially someone who has been entrusted with a position of authority to serve and protect all prisoners. We prisoners insist that any attacks against any prisoners in retaliation for our peaceful protest must cease immediately and the officers who are responsible for such attacks must be prosecuted to the fullest extent of the law. These particular officials who set out to provoke violence by attacking prisoners are not only committing criminal acts but grossly violate the authority entrusted to them by the public. For too long CDCR and PBSP have been abusing their authority, which each official took an oath to uphold – arbitrarily applying their prejudiced and racist views by attacking prisoners. Therefore, we prisoners insist that any attacks against any prisoners in retaliation for our peaceful protest must cease immediately and the officers who are responsible for such attacks must be prosecuted to the fullest extent of the law. All those who had a hand in the conspiracy must be included as well. Written Aug. 11, 2013 – There is a true and righteous commitment being made through collective sacrifice by men from all walks of life who have come together to end an injustice. We suffer collectively at the hands of a prison system (CDCR) that has lost its morality, its ability to effectively run a prison system that protects the wellbeing of each and every prisoner. Those of us who are held in Ad Segs, Adjustment Centers and SHUs ‘til this day, subjected to pain and suffering that’s being sanctioned by the state due to our peaceful protest, along with each and every prisoner who has contributed to our peaceful protest, past and present, by way of hunger strike and work stoppage, we hunger strikers commend you. And we want to say this before we deteriorate to a point where we’re unable to say thank you. To all our supporters: We can only hope that you do everything in your power to change these horrible conditions by continuing to work with prisoners throughout the state and nation in the hope that no one else in this country is made to suffer such a horrible fate ever again. 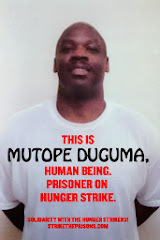 Send our brother some love and light: Mutope Duguma, s/n James Crawford, D-05996, P.O. Box 7500, Crescent City CA 95532. Editor’s note: Mutope had asked JR Valrey, Bay View associate editor who is also producing and hosting a series of hunger strike specials on KPFA, to interview him weeks ago. We asked permission for a phone interview that could be recorded for broadcast, but CDCR denied that request. So right away, JR sent Mutope a list of questions to answer and mail back. But Pelican Bay has been blocking the mail, so in this letter, the first we’ve received from him in weeks, he asks JR to try again. Written Aug. 19, 2013 – I have not received the letter from the Brother JR, so I do not know what’s up with that. But if he sent a letter to me, tell him to please remember when, because everyone is telling me they sent me this and that, but I am not receiving anything. I’ll need declaratories from everyone because we are keeping a record of out and incoming mail. I didn’t receive your mail until Aug. 17, and that should tell you how they’re trying to deprive us of any effective communication in order to compromise our correspondence. Hate has always followed hate, so they cannot change what they are – and that is vindictive, overzealous, reactionary individuals. And sadly they cannot even say why they do what they do. Let the Brother know that he should hurry up because I am 53 pounds down, have not eaten in 44 days and I am weak and fragile, Mary, but my mental capacity is strong still. Tell the Brother JR he can come up and visit or he can send me a questionnaire and I will give him the whole 411 at the root of our struggle and how it will serve all Californians. We are not just about changing our SHU solitary confinement placement; we are talking about helping all prisoners achieve their humanity through a sound, productive and constructive education that will help them be more aware of their lives and their actions. Plus, let the Brother know that he should hurry up because I am 53 pounds down, have not eaten in 44 days [Mutope began his strike a day early, on July 7], and I am weak and fragile, Mary, but my mental capacity is strong still. We are still in Ad Seg under Gestapo guard. Send our brother some love and light: Mutope Duguma, s/n James Crawford, D-05996, PBSP ASU G-2185, P.O. Box 7500, Crescent City CA 95532.